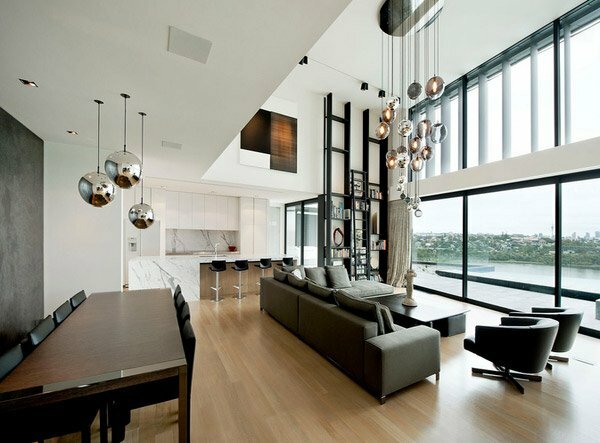 Considering to use the open design concept for your home? 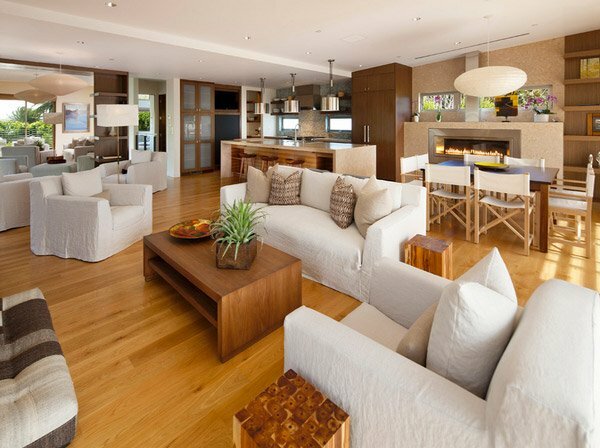 Today, we will be showing you how you can conceptualize your living space and your entire home for that matter. 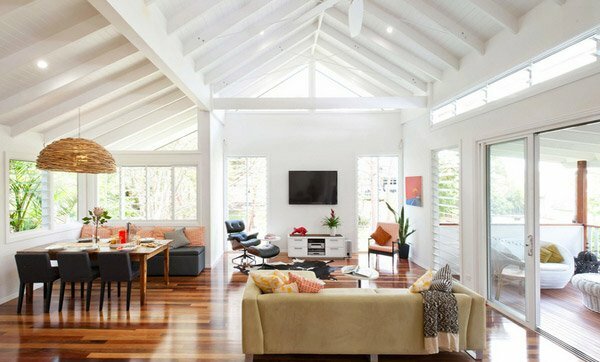 We will be showcasing you 15 Homey Contemporary Open Living Room Ideas which you could compare it to being in a department store wherein you can see all the spaces inside and maybe even outside your home at one time. Whatever the size of your home, you can always opt to use this type of plan because it works all the time! It gives you more space where you can place your furniture and furnishings that will work depending on the need. It allows you to save a couple of money because you have lesser walls or partitions which sometimes just adds up to your construction bills or maybe even contradict with the design concept you have in mind. Well, for now, let us check out the photos we are talking about. 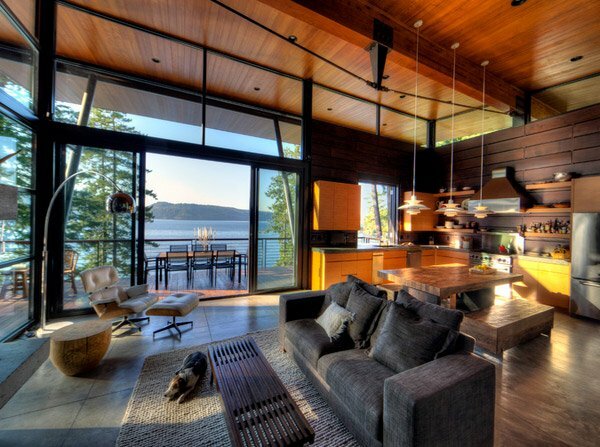 Large open plan living area with loads of natural northern light and breeze. This photo is a view from the summer kitchen to the living area of the family room. 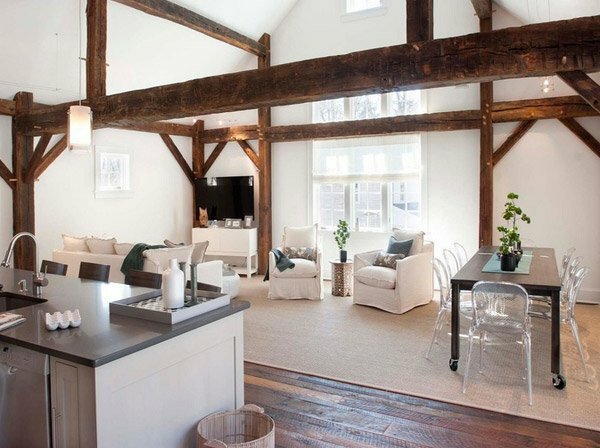 The original barn beam structure was re-introduced and is well defined through the use of light colored wall and ceiling elements. 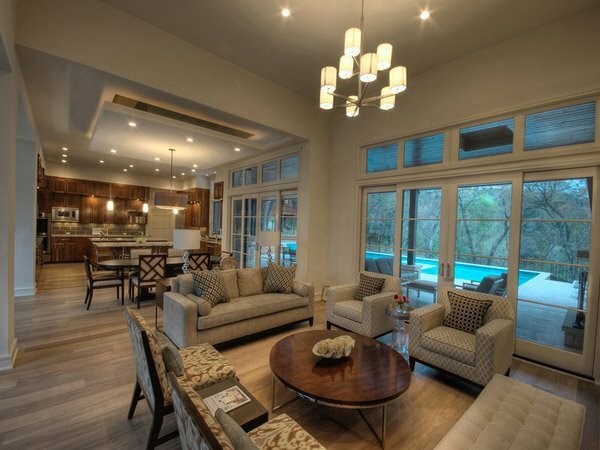 The great room combines the living room, dining room and kitchen. Radiant-heat flooring keeps the entire space warm. A delicate balance of natural materials and custom amenities fill the interior spaces with stunning views of the lake from almost every angle. The main living areas serve as a transition to a private natural vegetative bluff on the North side. Breezeways and terraces connect the various outdoor living spaces feeding off the great room and dining, balancing natural light and summer breezes to the interior spaces. 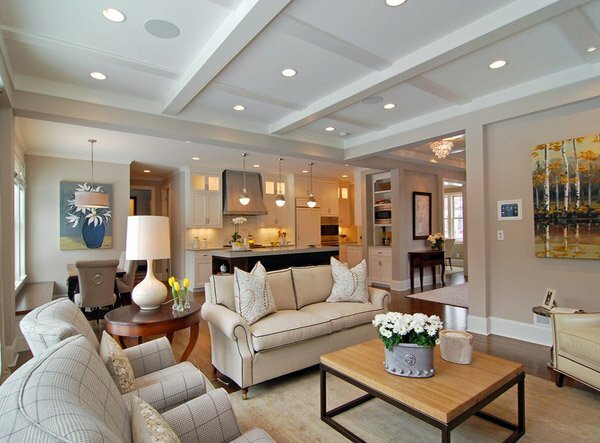 The custom millwork was done to replicate the look of the cabinetry in the open concept family room. 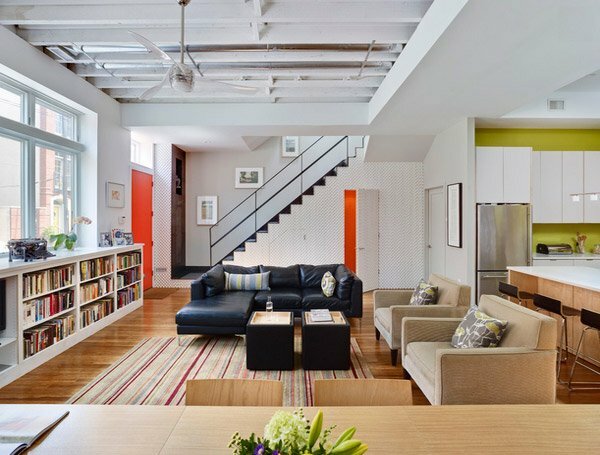 This completely custom renovation was eco-friend and is obtaining LEED certification. The kitchen opens to the living space or vice versa. 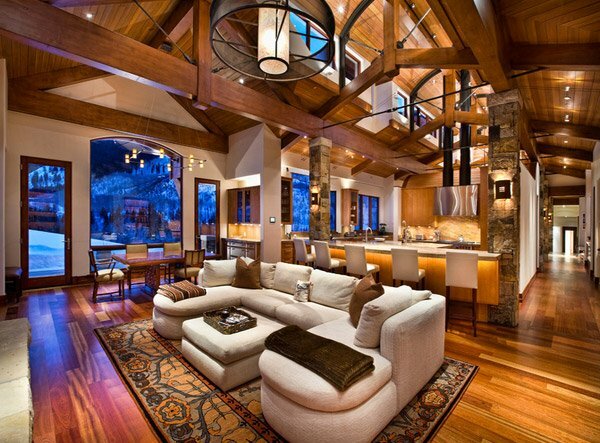 The high windows, the beams and the stone columns look stunning with the whites and browns of the furniture. We like the layout for bottom level entertaining. The bar has full service kitchen and ample sitting room. Open to the seating area with a place for large TV. Would like a TV behind bar. Separate areas have different flooring, like tile in bar area, wood near gathering area. We like the banquet seating of this living room and it has great artwork, furniture and furnishings that anyone would love to purchase in one heartbeat! 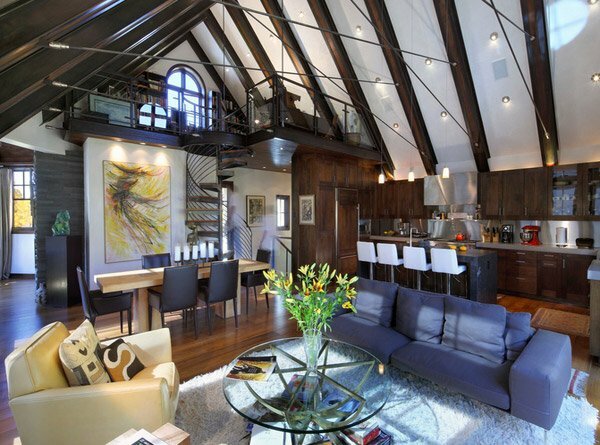 Beyond the front door, suspended reclaimed barn beams creates a rhythm down the gallery. To the left, the open fireplace is repeated outside on the patio. To the right, the end of the gallery becomes part of the master bedroom; the reclaimed barn doors slide across to enclose it. This living room has open concept and according to some friends, you feel a bit enclosed when you are inside this living room because it seems a bit cramped. But this space sure has its own individuality. The sitting area of this kitchen looks like its set up for conversation and hanging out. Not sure if there’s a TV in there, but it doesn’t look like it. We love how the small arched hallway breaks up the space and how there’s a cased opening in between the two rooms. The kitchen was kept open to the living area for easy entertaining. The big island has become the family’s daily gathering place and a go-to spot for special occasions. 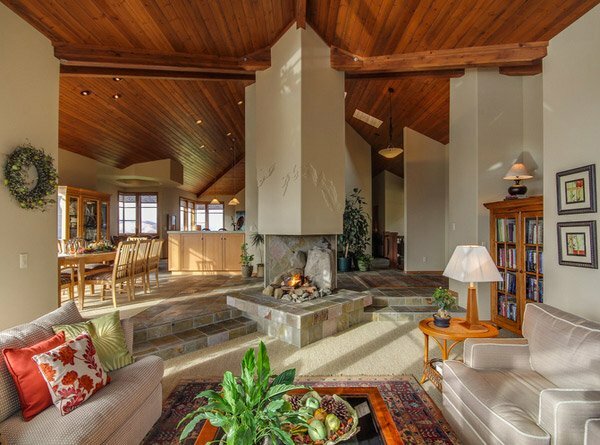 Sunken lounge, great fireplace, asymmetrical layout – three of the characters that this living space has which makes it one of a kind. As they say, “it’s not always hip to be square.” The asymmetrical layout definitely works. While some people often desire homes that feature individualized rooms and designated work areas, young homeowners are more interested in creating communal spaces where everyone at home can interact freely with one another. Open concept spaces allow individuals to constantly be aware of what’s going on around them, and it also serves to make the overall structure seem more spacious in design. From 15 Homey Contemporary Open Living Room Ideas to 15 Lovely Open Kitchen Designs, and so much more here on Home Design Lover, tell us what you think!